In 1997, in light of international developments with respect to asbestos, the ministère de la Santé et des Services sociaux (Québec's department of health and social services) set up the Comité aviseur sur l'amiante (asbestos advisory committee) to make recommendations concerning appropriate measures for informing the public about the asbestos situation in Québec and protecting public health in this regard. To carry out this mandate, the committee conducted a number of studies. These were synthesized in three documents that may be consulted on the website of the Institut national de santé publique du Québec (INSPQ) (De Guire et al., 2003; Lajoieet al., 2003; De Guire & Lajoie, 2003). 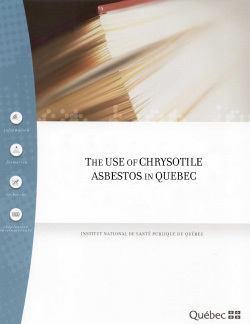 In 2002, the Québec government adopted a Politique d'utilisation accrue et sécuritaire de l'amiante chrysotile (Policy concerning the increased and safe use of chrysotile asbestos). As the name indicates, the objective of this policy is to increase the use of chrysotile asbestos in Québec by stimulating the processing of and the demand for chrysotile asbestos products (MNRQ, 2002). Since the publication of the INSPQ documents, contradictory messages about asbestos and its safe management have been circulating in the media and the general population. For this reason the INSPQ has decided to prepare an advisory statement on the use of chrysotile asbestos in Québec. The objective of this advisory is to provide an update on these issues. because chrysotile asbestos is a proven human carcinogen and causes asbestosis, and because in practice it is difficult to achieve safe use, especially in the construction, renovation and asbestos processing industries, the INSPQ is of the opinion that the promotion and increased use of chrysotile asbestos in its traditional forms should not be endorsed by the ministère de la Santé et des Services sociaux. In addition, considering the distinctive characteristics of asbestos-containing products (such as asbestos cement and asbestos bituminous pavement) that the Politique d’utilisation accrue et sécuritaire de l’amiante chrysotile (Policy concerning the increased and safe use of chrysotile asbestos) intends to promote, an additional report will be prepared to examine more thoroughly the impact of the use of these products. Nevertheless it would be prudent to control their use until the health risk assessment and the evaluation of required precautions concerning their use are completed. Finally, if the Politique d’utilisation accrue et sécuritaire de l’amiante chrysotile (Policy concerning the increased and safe use of chrysotile asbestos) is upheld, considering that it is founded on the enforcement of very strict safety regulations and conditions, as was the Canadian position on chrysotile asbestos at the Rotterdam Convention, the INSPQ reminds the government that the conditions listed above must be respected. In addition, all of the measures entrusted to various ministries for protecting workers and the general public from asbestos and for monitoring this substance must be carried out. Measures affecting the organizations not specified in the Policy and that could assume part of the surveillance and control of asbestos exposure in Québec in both public and private spheres should also be introduced.